Many of us now have subscriptions to our favourite newspapers. It's so easy to pick up your phone or tablet, or sit in front of your laptop and catch up on the news in real time rather than read a physical paper. I happen to read The Times. Online. 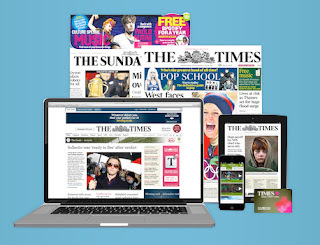 But if you want to cancel your Times Subscription you would think that you could just go online, as you can with many websites and click on a few links. Not so The Times. Obviously they don’t want you to cancel……..funny that. That's not to say that the Times isn't excellent online, I much prefer being able to read it on everything from PC to iPhone, but it's a pain to have to call rather than click if I want to opt out. I came across a lot of complaints online from people who have tried to cancel their subscription. Having written this a while back I decided to check for myself and update this post as necessary. There is an easy way to cancel your Times subscription. Choose the cancellation option you’ll be offered - at time of writing it is option 4 and then option 4 - and within a moment or so you’ll be put through to someone who will then hopefully offer to give you a deal. Or will help you cancel. You have to give 15 days notice within a billing period, which seems reasonable, but otherwise it seemed simple. You can also email help@timesplus.co.uk but frankly it was so quick to call I wouldn’t bother, as then you have to wait for a response. If you try and use the Live Chat option for this on The Times website they will tell you to call the number above. It should be much easier to cancel your Times subscription. But it isn’t difficult. It also makes you think about all those other subscriptions you might have, where a quick call may benefit in an offer you weren't going to be made unless you decided to leave. After all, retaining the customer is so much the name of the game. After a 32 minute phone call and 3 people on 4/3/17, these people would not cancel my subscription. So be warned they start quoting 'terms and conditions' referring to a 14 day notice period. Even a supervisor would not help. So I cancelled my direct debit and wrote a letter of complaint. Letters must be sent to Member services, 1 London bridge street, London, se1 9gf. I would advise anyone not to bother with the subscription service as the aggressive call centre people are very unhelpful.